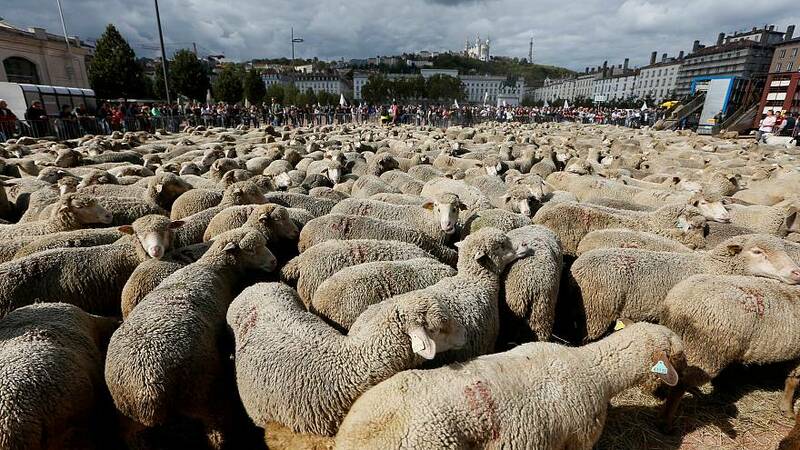 Hundreds of farmers and their sheep filled the streets of Lyon, France, to protest a government policy that protects wolves. Farmers claim the predators are responsible for major losses in livestock, hitting their finances. Last year in France, 9,000 sheep were devoured by wolves. Because of this loss in livestock, the government has payed 22 million euros worth of indemnities to farmers. There are only 360 wolves in the country. A five-year government policy set to begin in 2018 allows only for a limited number of wolves to be killed each year. But farmers’ unions are taking a firm stand on having more rights over shooting the predators. The new protective measure aims to avoid wolves becoming extinct again. In the 1930s, hunting of European grey wolves caused the species to become extinct in French territory. It was only in the 1990s that the animal was naturally reintroduced in the area. Problems between wolves, farmers and sheep are not exclusive to France. In Italy, Spain and Germany, the issue has also sparked debate in the past.